Unidentified baby and tiger cat. Snapshot postcard, ca.1910. Photographer unknown. Until amateur photography became both easier and relatively inexpensive in the 1880s, candid photos of animals doing “animal stuff” – eating, drinking, rolling, playing, sitting on laps — were uncommon. In this post, I’ll offer a short history of photograph postcards and share a few of my favorites. “Elmo and Snookums,” snapshot postcard, 1920s. Photographer unknown. Between 1900 and 1930, home photographers had a lot of fun creating photographic postcards that could be mailed to friends and family. Postcards first appeared in 1898, the same year that Congress authorized Rural Free Delivery, where folks in small towns and the countryside began to receive mail directly to their addresses. Beginning in 1902, camera shops began to offer “postcard format” cameras and developing paper that was sensitized on one side and had printed spaces for addresses and messages on the other. The breakthrough for ordinary folks was the 1907 3A Folding Pocket Kodak, which cost $10 to $12.00. Kodak stopped making postcard format cameras in 1941, but the era of home postcard photography had really ended at least a decade earlier, replaced by smaller-format snapshots. I like snapshot postcards; even the blurry ones have a nice quality, which I guess is associated with the fact that they were contact sheets rather than enlargements. But what I especially like is the idea of them, that people sent pictures of themselves on postcards through the mails doing ordinary stuff. And as a historian, I especially like when the postcards were sent through the mails and contain information on the animals depicted. 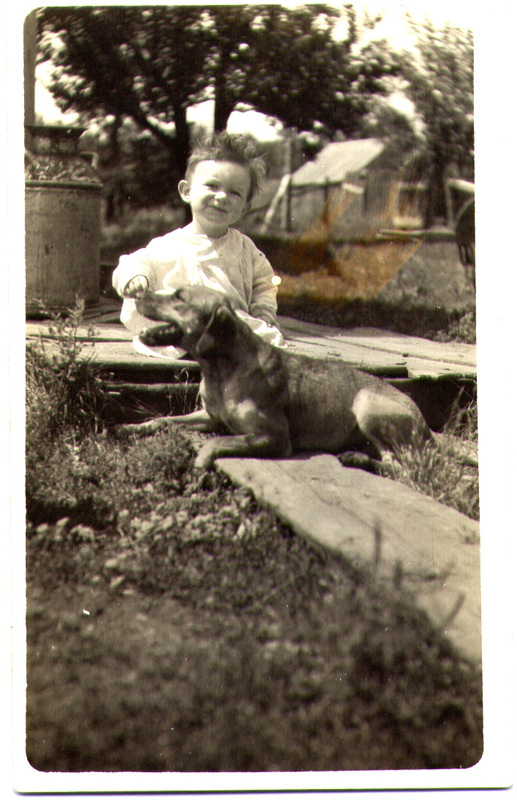 Unidentified boy and his dog. Snapshot postcard, 1920s. Photographer unknown. These are three photo postcards that I bought early in my research for my book Pets in America – they are still some of my favorites. These three postcards were never sent. Only one has any information on it, the brief instruction “Elmo and Snookums,” But all three pictures tell us a lot. I love that Elmo is “beeping” the nose of Snookums. (I suppose that the names could be the other way around….) 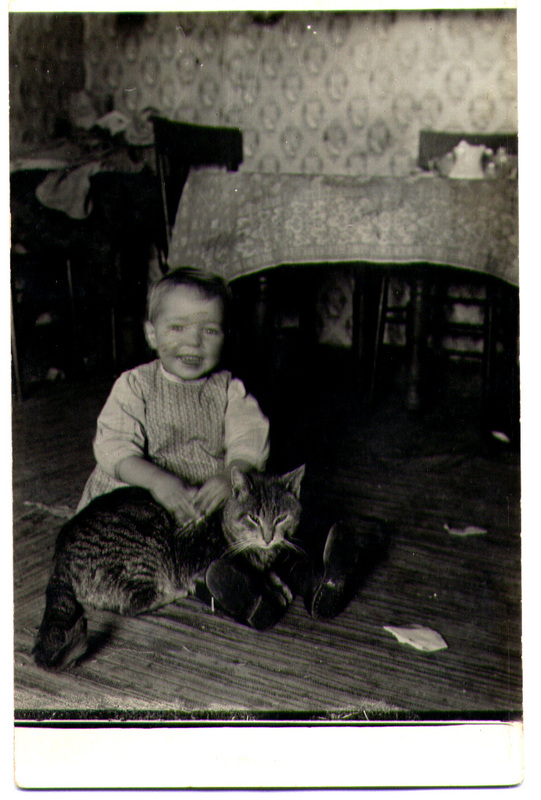 The pleased expression of the toddler with the big cat on her lap and the calm expression of the cat reach across a hundred years. 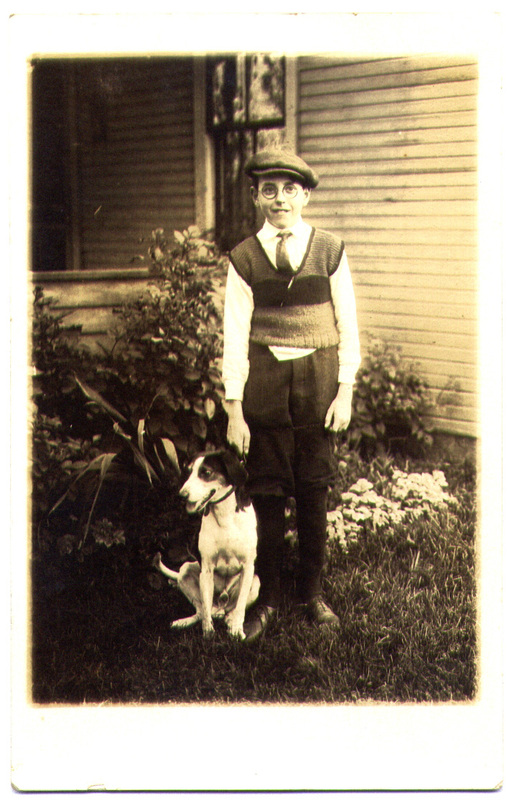 The lanky boy, in his outgrown play clothes, with his lanky dog pictures a long lost moment in the history of boyhood. If you are interested in learning more, there are a number of guides to what collectors call “real photo postcards.” They’re especially helpful for dating examples when postcards lack inscriptions or postmarks. Thanks for a very interesting post. You are right. We never saw so many cute pet pictures before. You had to take out a camera, set it up, and wait to capture that fleeting moment when your pet would do something cute – and then if nothing happened, you’d have wasted all that time on nothing.